Some scientists have seen the ultimate sky show, and the fact that the sky isn't ours only makes it cooler. Gas giant Jupiter features some epic aurora beyond-borealis (and ultra-australis) and the causes make ours look like two small sparklers in a bucket of water. On Earth auroras are caused by the interaction between the solar wind and the upper atmosphere. Energetic particles slam into the upper atmosphere, slowing down and losing energy to electrons in the atoms already there. More electrons gain energy from magnetic fields in the solar wind particles violently rewiring themselves and our magnetosphere. Excited electrons from both processes then fall back down to their original state, emitting light as they go – different colors coming from different materials in the atmosphere. On Jupiter the idea is the same but the energetic particles come from considerably cooler sources. Hubble images show huge "auroral footprints", moving radiation zones following the moons. 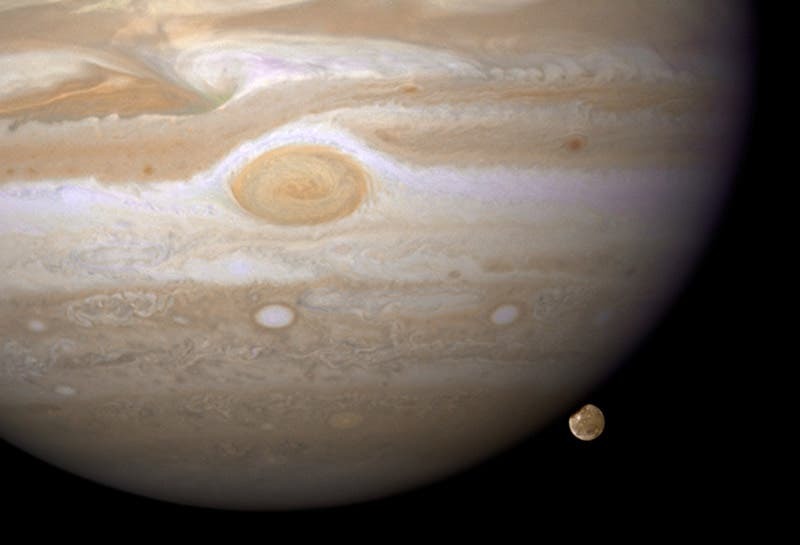 Ganymede causes one by being the only moon in the Solar system with its own magnetic field, which constantly interferes with Jupiter's far larger one. Io, on the other hand, is famous for its volcanoes – volcanoes which spew highly charged particles which spark and shine as they collide with the moon's host planet. We're going to repeat that: a volcanic moon triggers vast light shows by erupting onto a vast planet. We don't even need to send that to Hollywood, the sheer coolness of the sentence ensures they'll see it somehow. 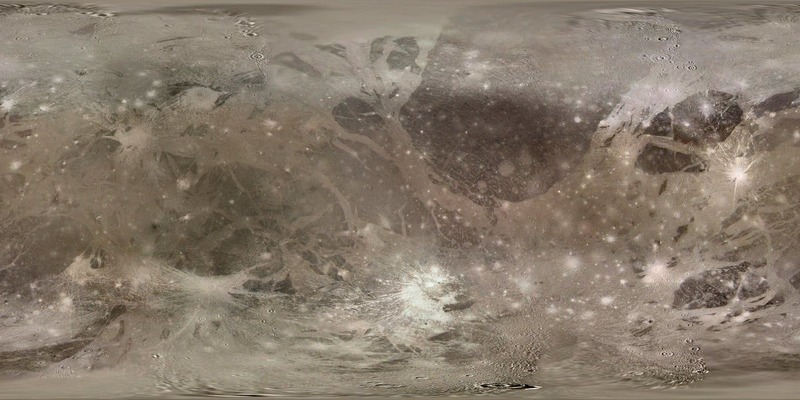 Image at top of page of Ganymede was created from more than 100 images from the Voyager and Galileo spacecraft. Most of these had a resolution of roughly 0.7-3.5/pixel km except for two relatively small areas where the resolution is considerably lower.